A cutting-edge cancer center in St. Petersburg is being kicked out of its building in the city’s upscale neighborhood. The building is being turned into a hospital for the Supreme Court and the Higher Arbitrage Court, which are relocating from Moscow. In St. Petersburg, the wave of mass protests is growing against the Presidential Executive Office’s decision to evict one of the largest budgetary hospitals (Hospital #31) from the elite Krestovsky Island, as the hospital is home to a unique pediatric oncology department. The building that houses Hospital #31 is to be taken over by a hospital for Supreme Court and Supreme Court of Arbitration employees, who are moving from Moscow to St. Petersburg for the Constitutional Court that settled there in 2008. Doctors and patients are outraged. 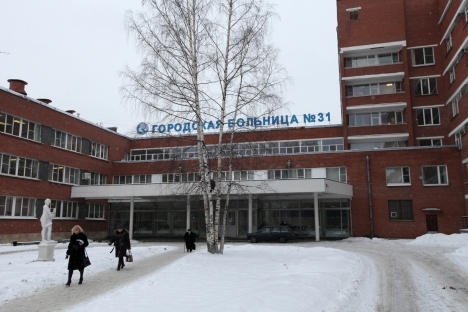 Hospital #31 created unique conditions for child cancer diagnosis and treatment in St. Petersburg. “Every year in Petersburg, about 100 children get cancer, half of them are treated by us,” says Margarita Belogurova, head of the Pediatric Oncology and Hematology Department at Hospital #31. “In 10 years, we have reduced mortality from 75 percent to 25 percent. If they force us to move, we will have to trash new expensive equipment: its warranty period is not over yet, no one will undertake to dismantle it. The integrated operating rooms made once and for all will be destroyed. We have a unique radioisotope laboratory – there is no way to move it either,” she added. On Friday, Jan. 18, patients’ relatives staged a picket in front of the hospital. With temperatures at minus 20 degrees Celsius, women did not hold back their tears. “The authorities must realize: their decision may result in a death sentence for the kids,” said Irina Stelmahova, a mother of a child with cancer. On the same day, a petition was drawn and addressed to President Vladimir Putin, with a request not to disband the hospital. At 3:00 p.m. on Monday, Jan. 22, it was signed by 61,094 people. Contrary to an assurance made by Governor Georgy Poltavchenko of St. Petersburg that "the closing of Hospital #31 is not considered," it was decided on Dec. 13, at a Moscow meeting of the interdepartmental working group on the higher courts’ move, that "the healthcare services are planned on the basis of Hospital #31." The meeting included Minister of Health Veronika Skvortsova and Vladimir Kozhin, head of the Presidential Executive Office that is organizing the judges’ move from Moscow to St. Petersburg. A final decision regarding the hospital’s fate will be made on Jan. 25. So far, the only alternative being offered is far from perfect: to move the Pediatric Oncology and Hematology Department to Children City Hospital #1. The oncologists disagree. On Jan. 15, Olga Kazanskaya, the vice governor of St. Petersburg, promised that no one will hurry the decision, but she confirmed the move is inevitable. According to Kazanskaya, the decision was made by the Presidential Executive Office. In 2008, Hospital #31 was deprived of a part of its territory when a clinic was built next to the hospital to serve the Constitutional Court judges that had moved to St. Petersburg that year. The Constitutional Court judges settled in mansions nearby on the same Krestovsky Island. In private conversations, some medical officials and chief physicians express regret that, while international economic forums and summits are hosted in St. Petersburg, there is still no special clinic for heads of states and ministers. The story is based on materials from Novaya Gazeta and Kommersant Daily.